Let's jump right into another Minute Beauty review! I got these Missha Fluid Eyes eyeshadows back in Spring. Back then they were a completely new release - 5 shades of metallic liquid shadow. I picked up two CR01 Sensual Coral and PP01 Dust Purple. Do I like it? I would definitely say yes. These Missha Fluid Eyes are great one-shadow kind of product that you just apply to your eyelids, pop on some mascara and you're pretty much good to go. The colors are very pretty and quite sheer - very office appropriate - but can be built up to a more vivid finish. The packaging is very simple and sleek - clear and black plastic. The plastic itself is sturdy and it doesn't feel cheap. It's very akin to pretty much every other item from Missha - chic and simple. The applicator is an angled doe-foot. I find it's very appropriate for the consistency and picks up enough product to cover both eyelids. The consistency of the Missha Fluid Eyes is less liquid and more mousse-like. It spreads well, and doesn't dry too fast so you have time to blend it out. The colors are rather muted and there's plenty of micro-shimmer throughout. 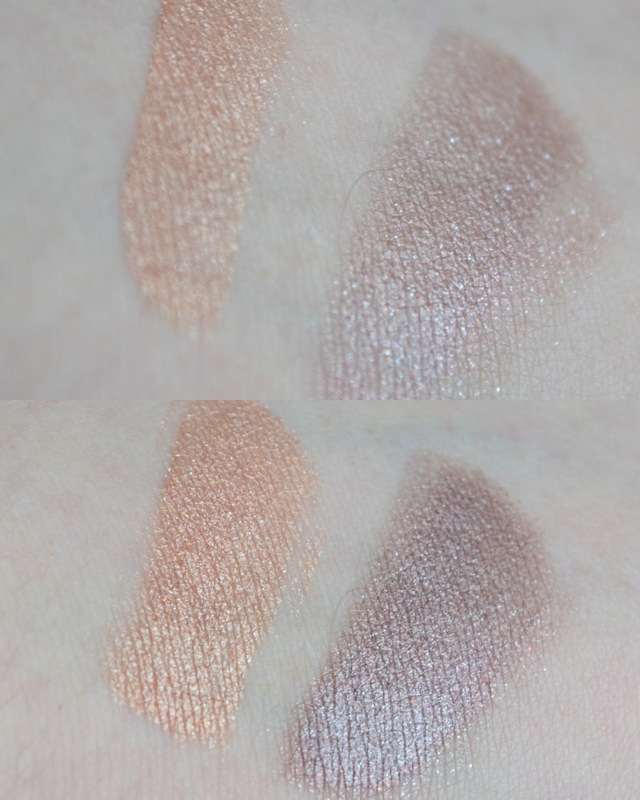 On Missha's website the swatches looked more vivid than they do in real life, however that could be due to layering. The swatches bellow are top - single layer and bottom - two layers. As you can see, the color builds up beautifully. I enjoy the shades, although I think CR01 is a little misleading - this is almost a straight-up golden shade! Especially when layered. It looks beautiful in a single layer with just a touch of mascara and a bold lip (either browns or reds). Sort of awakens the whole face and gives your eyes a 'glimmer'. The Dust Purple shade is, on the other hand, very aptly named. It's a silver-mauve shade with a more intense metallic finish upon layering. I like this as the sole lid colour when layered, it gives a smoldering look that's still appropriate for daytime. It's also gorgeous when paired with greens and blues! I don't love it, however. That is due to one problem - Missha Fluid Eyes shadows crease. Not a whole lot, so it's not a big issue, nothing a quick pat won't fix. But it is worth mentioning, especially if you plan on running around with it - apply a primer if you want it to stay perfectly smooth all day. I am looking into the other colours, will let you know how that goes! Would I recommend it: Definitely! It's a great one to have when you're in a rush. Hope you found this Missha Fluid Eyes review useful! Comment bellow if you've tried these, perhaps you had a different experience?